Agate Falls – Western U.P. 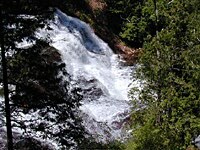 » Agate Falls – Western U.P. Large beautiful waterfall that is visited by many people. Located just off of M-28 The short hiking trail is well-marked and easy to find. Directions: Go 6.5 miles East of Bruce Crossing on Hwy M-28. You will see a sign on the Hwy at the Bridge. Park in the parking area on the south. Follow the well marked trail under the bridge to the waterfall.